Christianity obviously works better for some Christians than others. Sometimes the Iron Law of the antichrist spirit blocks Christians from receiving blessings they should have. Cost includes 428 days of access after purchase date. The very definition of a principle is that it is a universal, non-optional, cause and effect relationship. Thus, it is extremely frustrating when a Christian invests in a principle and not only does not get good fruit, but he gets the opposite of what he should receive. 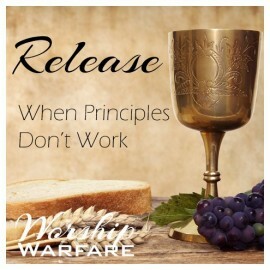 Sometimes we are only deceiving ourselves into thinking that we are sowing into the principles and we are not, but there are seven specific areas that the antichrist spirit of the Iron Law devours. Arthur explains each one of these so that you can identify them and evaluate your own life. The Holy Communion service at the end involves very specific warfare to break the antichrist spirit off your life so that the principles function once again, as they should. This last section of the week’s series of three live streams wraps them together for a great cumulative effect that somehow still surpasses my understanding. This one was good the first time, but after watching a second time I got so much more out of it. To get retroactive effect of baptism, of Jesus’ death and resurrection, to get completely free from that illegal iron law of the enemy… not just from the king of darkness but from the law, too… is revelation to me, and precious. I’m also absorbing the clear, valuable teaching from Deuteronomy 28. But the principles of the clever illustrations of the “straight bananas” and Lazarus’ grave clothes as expounded in this live stream have raised more questions for me. Although not comfortable, I believe it’s good. For having lost the ability to dream again… for greater streams of living water… for “the law of the spirit of life in Christ Jesus” and all that means… there’s just more to it than I know, more to absorb, more to work out…. because of this live stream. On to the “surpassing glory.” Thank you, Arthur. Watching the two previous videos in this Release series has been been exposing deeply embedded flavors of the religious spirit in me, which I had not been able to recognize no matter how hard I tried to figure out where the weird influences were coming from. After that cleansing, the fathering wisdom in this Worship and Warfare installment is landing more deeply in a spiritual sense than ever before. The illumination of the blessing sequence in Deuteronomy 28 is wonderful to listen to, as well as the retroactive prayer for baptisms done without full understanding of how to renounce the laws of the kingdom of darkness. The illustration that grips me the most is the picture of Lazarus coming out of the grave still bound. The Savior "raised" Lazarus and "carried" him out of the tomb, but then the resurrected man still had to be set free from the grave clothes. The need to enforce the power of the resurrection makes so much sense. That is often used in an attempt to make people afraid. But reaping good fruit when we sow good seed is central to Scripture. Why are some people left out?